Address Our Mess understands the psychology of these scenarios. With their trained crews, they understand the difficulties that many hoarders go through when doing a hoarding cleanup project. Address Our Mess understands the necessity of this training, and that is why they understand the psychological issues that hoarders deal with in their mind. Address Our Mess is a specialty cleanup company that does work in over 28 states that ranges from clutter to estate cleaning. Much of the work that they do in the Mid-Atlantic States of Maryland, Delaware, New Jersey, and Pennsylvania deals with hoarding. Hoarding is often brought on by the onset of a psychological problem that makes the individual obsess over particular items and gather more of them. In certain cases, it can reach a point to where it is hazardous to a person's health and living conditions. When doing work with a hoarding project a person needs to understand the psychological aspects of the individual, and not treat this project like a standard junk removal project which is a common mistake. Junk hauling and hoarding cleanup are similar only to a point that the individual are dealing with excess items. A person who wants to remove items from a property without having an attachment towards them would contact a junk hauler. Hoarding is caused by an individual's unwillingness to give up the items that they have collected. If a person does try to remove items, then the hoarder can become protective of the items in the property. Hoarders tend to see it as a way of saving the past or protecting something that is close to their emotional core. Hoarder’s emotional attachments to particular items are sometimes brought on by the onset of a traumatic event in their lives. A specialty hoarding cleanup service company understands this emotional hold that the hoarder has to particular items. This can be hard to grasp, but they have deep emotional attachment to an object that can be borderline family-like affection. It can be emotionally painful for them to have these items removed from their lives. This leads back to the psychological nature of hoarding. Sometimes it is hard for an individual to decipher between items that they want to keep that are useful to them. The specialized training that Address Our Mess’s technicians go through helps the hoarder cope with the removal of the item. Showing compassion towards the hoarder, helps build up the trust they have towards Address Our Mess’s technicians and it helps make it easier for them to remove items further on down the process. Address Our Mess understands the necessity of this training, and that is why they understand the psychological issues that hoarders deal with in their mind. 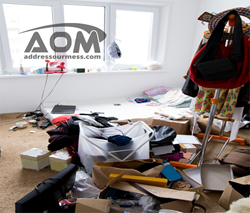 Address Our Mess is headquartered in Maryland has many years worth of experience handling hoarding situations. The company currently operate in over 28 states and is expanding their reach further afield. Get in contact with a company that can compassionately handle a hoarding cleanup situation.